So. When I first moved to San Francisco, I had a summer internship at the Cartoon Art Museum. Once the internship ended, I continued to go into the museum from time to time, but I started drifting away from it. 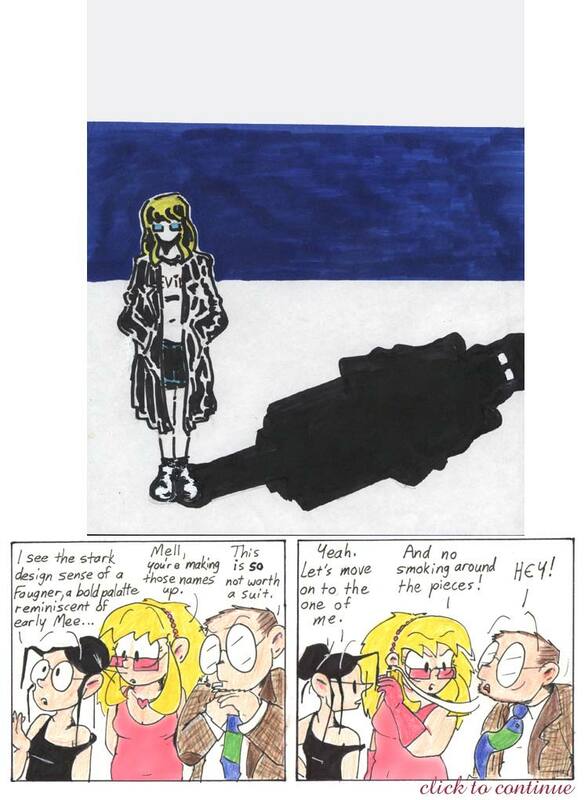 My two-week job at Viz had extended to a full-time receptionist position, I was living in Pacifica with a coworker and had a massive commute to and from the city, and Narbonic kept me pretty busy. I didn’t make the time to come in and man the admissions desk at the museum every week. One day I was showing a couple of online friends, people from the MST3K Usenet group (it all keeps coming back to the Usenet group), around San Francisco. We stopped at the museum, and I said hi to Jenny, the curator. There were two volunteers at the admissions desk: a Japanese woman, and a dark-haired man I immediately wrote off as the kind of good-looking guy who would never even look my way. He was trying to talk manga with the Japanese volunteer. After watching her struggle politely to understand his mangled attempts at pronunciation, I stepped forward and told him how to say Osamu Tezuka’s name. Gals, this is an excellent way to pick up men. Men love it when you correct them. Especially on subjects they consider themselves to be experts on. It’s their favorite thing. I still don’t know why I thought it was a good idea to write down my URL and pass it to the guy behind the counter, the guy I had just schooled on his own turf, the guy who was miles and miles out of my league. Afterwards, my friends and I laughed about it. And agreed he was cute. Like there’d been anyone else in the room for me. Andrew gave me these pinups after we’d been hanging out at the museum for a few weekends. I started coming in every Saturday, and so did he. We spent every Saturday afternoon behind the admissions desk, talking, joking, and insulting the patrons. Sometimes we went out to dinner afterwards. Andrew had moved to San Francisco that January, after an unsatisfying year temping in Boston. He had been ready to give up on San Francisco, too, until he happened on a Craigslist ad for the Cartoon Art Museum. Now he wasn’t sure what he wanted to do. I felt the same way. We were rapidly becoming best friends. When he handed me these drawings, I squealed and bounced around in a circle. They were the most beautiful, unbelievable drawings of my characters I could ever have imagined. They still are. This may be the most important strip in the entire run of Narbonic, and not just because I snazzed up Helen’s dress with the “Plastic Wrap” filter on Photoshop. (Also note that Dave is wearing his tweed jacket from the paper-doll set.) I’ve been looking forward to rerunning this one. As an aside, I really, really hate pantyhose. I think you use the word ‘garrote’ every time pantyhose comes up, and I don’t think you use it any other time. It’s how I learned the word. I love these! I didn’t really get Helen’s one at first, but then I looked at the shadow.